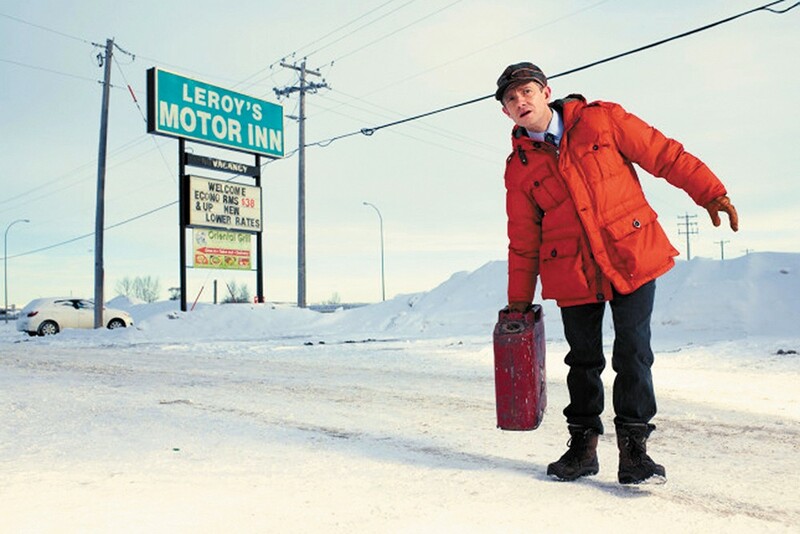 Martin Freeman kills (literally) in FX's Fargo. Of all the miracles the TV series Fargo (FX, Tuesdays at 10 pm) brings us — and this is a series where water turns to blood — the most truly miraculous is this: Fargo is a TV show that not only lives up to the Coen brothers' movie of the same name, but rapidly renders competitive comparisons inconsequential. The movie and TV series sing separate songs, but in harmony, each one making the other more interesting, more profound. Like the movie, Fargo is set in small-town Minnesota. Like the movie, the TV series has its in-over-his-head emasculated sap (Martin Freeman) and its kind-but- brilliant female cop (Molly Solverson). But only the TV show has someone like the smirking Lorne Malvo, played with a sinister charisma by Billy Bob Thornton. Malvo's a trickster demon: Mephistopheles come to Minnesota. He could kill directly, by shooting or stabbing. More often, he just spots a man's weakness — his insecurity, his guilt, his greed, his cowardice or jealousy. He grabs ahold of those flaws, and begins cranking them up like a wind-up toy. Then he lets them go and watches from a distance as they destroy themselves and everything around them. Across the snowy roads and small-town diners, a cosmic struggle unfolds. Evil sets events into motion, good tries to stop it. That's an old tale, but Fargo tells it with a fascinating vibrancy, nailing the Coen brothers' tone without ever feeling like plagiarism or imitation. This is a world where tragedy and comedy swap masks. Dark moments are coated in light absurdity; lighter moments are drenched in dark dread. Fargo's camera captures that gorgeous paradox: It gives us the claustrophobic openness of those icy Midwest expanses, the terror of a whiteout blizzard, the violent beauty of gunfire blasting through drywall, sunshine streaming through the bullet holes. Sat., April 20, 8:30 p.m.